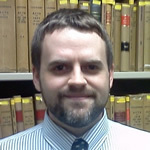 Prior to his position as the Instructional Librarian at Concordia College-Moorhead, MN, Kevin Baggett was the Access Services and Electronic Resources Librarian at Louisiana State University Paul M. Hebert Law Center Library from 2008 to 2014. After a four year stint in the US Navy, he earned his B.A. from the University of Mississippi and his M.L.I.S. from Louisiana State University.